In the spring of 1914 Einstein arrived in Berlin to take up his new position at the Prussian Academy of Sciences. During the next 3 years he completed the general theory of relativity, surely the high point of his scientific life: the "years of anxious searching in the dark" had led to the "final emergence into the light," as he described it. 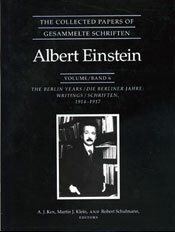 His writings on relativity in this volume include his popular exposition of the special and general theories, first published in 1917 and still a valuable account for the general reader. His major clarification of the quantum theory of radiation appears here as well, along with his lesser-known contribution to the formulation of quantum conditions and the papers describing his only experimental investigation, a study of Ampere's molecular currents, which he carried out with the Dutch physicist W. J. de Haas. Before World War I, Einstein had never expressed his views on nonscientific subjects. Yet now he signed an "Appeal to Europeans," urging an immediate end to hostilities and a joint effort toward the goal of European unity. Two other public statements by Einstein and a number of important obituaries that he wrote in this period round out the volume.